Supplier costs continue to rise at an accelerated pace. Echelon provides current and historic analysis on both contracts and transactions to uncover cost savings opportunities. This analysis will provide your organization with the data needed for successful supplier negotiations and purchasing decisions. Unlike other solutions, Echelon pulls the BI analysis into normal business processes to ensure adoption and achieve maximum results. 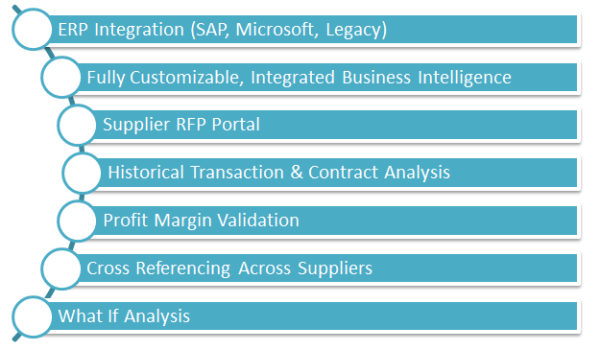 Echelon integrates the cost optimization process with pricing optimization and RFP workflows. This enhances the organizations ability and propensity to successfully achieve results by constantly looking for margin improvements from all angles. Furthermore, the BI analysis becomes a part of the normal business process workflow, maximizing opportunities for increased profits. Customizing BI solutions can be very expensive, time consuming and ultimately yield less than optimal results. Echelons unique BI architecture allows it to be truly customized, quickly and effectively to utilize all your available data. This guarantees a perfect fit for your organization ensuring accurate results and the highest ROI.